HOUSTON, TEXAS (September 30, 2008) When the WNBA Finals get underway between the San Antonio Silver Stars and Detroit Shock on Wednesday, Rice women’s basketball coach Greg Williams has an interesting dilemma on which team to pull for because of his strong ties to both franchises. Williams was an assistant coach with the San Antonio franchise, formally the Utah Starzz in 1997. He moved to Detroit a year later helping the Shock to a 17-13 inaugural season record. Two years later, Williams became the Shock’s head coach and director of player personnel. He selected Deanna “Tweety” Nolan in the 2001 WNBA Draft, who scored over 20 points for Detroit in all three games of the WNBA Eastern Conference Finals against the New York Liberty. Nolan will most likely guard Silver Stars leading scorer Becky Hammon, who played for Williams at Colorado State. Hammon poured in 35 points on 10-of-18 shooting in San Antonio’s 76-72 game three triumph over the Los Angeles Sparks. Both Nolan and Hammon were 2008 WNBA All-Stars. But the connections don’t stop there for Williams or the Owls. Game one of the finals is scheduled for 6:30pm CT on ESPN at the AT&T Center in San Antonio. HOUSTON, TEXAS (September 29, 2008) Rice University vollyeball player, Meredith Schamun, of Murrieta, Calif. (Vista Murrieta H.S. ), has been selected as the Conference USA Setter of the Week for her performance this past weekend. Schamun dished out 104 assists in two C-USA road matches for a sterling 13.00 assist-per-set average, the most in C-USA for the week. She had 54 assists in a four-set win at UTEP and totaled 50 in a tight four-set match at Tulane. She also had four block assists and 11 digs while directing a balanced attack as four players reached double-digits in kills (three over 20) on the weekend. The sophomore is now averaging 11.88 assists-per-set, which ranks as the third-best average in the nation. Penn State's Alisha Glass is first at 12.29 (516 assists; 42 sets), while Jenna Hagglund of Washington is second at 12.10 (508 assists; 42 sets). The Owls (9-2 and 1-1 in C-USA play) are in action this weekend as they host SMU on Friday at 7 p.m. and Tulsa on Sunday at 1 p.m. Matches are in Fox Gymnasium and admission is free. HOUSTON, TEXAS (September 28, 2008) The University of Houston soccer team dropped a tough 1-0 matchagainst Conference USA-rival East Carolina on Sunday at Robertson Stadium. Houston (4-5-0) controlled much of the possession andplayed a more aggressive match offensively, outshooting the Pirates by a 12-8margin - with five shots on goal – but could not find the back of the net. “I thought this was the best we have played in the pastfour or five games,” head coach Susan Bush said. “We need to find a way to score goals. We have been outplaying and outshooting ouropponents but we have struggled finishing. It was the Cougars’ fourth-straight, one-goal loss since theteam’s season-long, four-game winning streak. Houston has battled injuries all season, forcing several lineup changes,including in the team’s backline. Sophomores Lauri Byrne, Jessica Rathweg and StephanieBooker teamed up with freshman Stephanie Derieg in the back for the Cougars andall helped solidify the defense. Theytightened up in the first half, allowing East Carolina only one shot as the Pirates never really threatened offensively in the first 45 minutes of play. Senior goalkeeper Shelby Scott also played well for theCougars, coming off her line to disrupt several Pirate counter attacks andrecording a save. Junior Kaitlin Thulin led the team with three shots whilefreshman Jessica Zavalza added a pair of shots. The Cougars return to action next weekend, facing C-USAfoes Tulsa and SMU at Robertson Stadium on Friday and Sunday, respectively. COLLEGE STATION, TEXAS (September 27, 2008) The Black Knights found the end zone with 8:46 left in the fourth quarter to take the final score to Texas A&M 21 Army 17. They began their final scoring drive at 14:55 left in the game. Patrick mealy capped off a 10 play, 39-yard scoring drive with a 4-yard rush on third and goal. DeMarco tagged the conversion to close out scoring for the game. Final score: Texas A&M 21 Army 17. COLLEGE STATION, TEXAS (September 27, 2008) The Black Knights of Army traded a field goal for touchdown at the Texas A&M Aggies pushed the score and their lead to 21-10 at the end of three quarters. The Aggies found the end zone again at 13:44 in the quarter when sophomore quarterback Jerrod Johnson completed a pass to McCoy for 11 yards and the touchdown. Bean again concerted the kick to take the score to 21-7 in favor of the Aggies. Army mounted a drive on the next possession, which entailed 71 yards on 17 plays, but could not find the end zone due to a tenacious Aggie defense, settling for a Matthew Campbell field goal to close out scoring for the quarter. The Aggies drove 39 yards in 10 plays running 5:28 off the clock to end the quarter. COLLEGE STATION, TEXAS (September 27, 2008) The second quarter of the Texas A&M-Army game saw the Aggies explode for two touchdowns and the Black Knights found the end zone on a 9-yard run by Tony Dace. The Aggies drew first blood in the second quarter on a 42-yard pass from quarterback Stephen McGee to wide receiver Jeff Fuller. The first and ten play from the Army 42-yard line occurred at 7:12 in the quarter. The conversion by Rickie Bean was good to make the score 7-0 in favor of the Aggies. Army came right back on a 9-yard run by running back Tony Dace at 3:09 in the quarter, who, along with Adam DeMarco’s kick tied the score at 7 all. In a fluke of all flukes, Army quarterback Chip Bowden rushed for 1-yard on a third and two play and promptly fumbled the ball at the Aggie 36-yard line. It was recovered by Aggie defensive lineman Paul Freeney; and surrounded by a bevy of maroon jerseys, ran 58-yard for the score. Rickie Bean again converted the kick to make the score 14-7 at the half. COLLEGE STATION, TEXAS (September 27, 2008) After a 1st quarter that saw neither team reach the end zone, The Black Knights of Army is showing they intend to avenge their loss to the Texas A&M Aggies from 2 years ago. Virtually leading in every statistic, they were ahead of the Aggies in first downs (3-0), net rushing yards (51-4) total offensive plays (16-9) and total offensive yards (55-20). The Aggies held the edge in net passing yards (24-4). Neither team can seem to find the offense drive to advance the ball pass the midfield, as the defense shuts down each offensive set of plays before they can get started. The Aggies failed to get any third down conversions, while the Black Knights were able to find success twice on five third-down conversions. COLLEGE STATION, TEXAS (September 27, 2008) It is a bright and slightly muggy Saturday, September 27, 2008 at Kyle Field in College Station, Texas. It could be a football game that could transcend the ages. In fact, in their fourth meeting that dates back to 1969, the Black Knights of West Point and the Aggies of Texas A&M will face off in their fourth meeting, with the Aggies holding a 2-1 record over Army. In the inaugural game on October 4, 1969, the Aggies defeated the Black Knights 20-13, with Army evening the series in 1972 24-14. In their last meeting, the Aggies came from behind late in the 4th quarter to beat the Knights 28-24. On this mild day in Aggieland, both teams will try to improve on their 2008 season records. Texas A&M is 1-2 while Army is winless at 0-3. In outlooks for the game, Aggie freshman Jeff Fuller will attempt to break a freshman record for the Aggies. Just three games into his A&M career; he is just one receiving touchdown shy of the record. He is also on pace to set freshman records for season catches and yards. All American and Ray Guy Award candidate Justin Brantly will be seeking the 32nd 40-yard plus punt average of his career (in his 40th game) against the Black Knights. Brantly currently leads the Big 12 in punting with a 46.0 average, and ranks number 6 nationally. with 45 “coffin corner” boots in his career, Brantly has deposited more than 25 percent of his punts inside the opponent’s 20-yard line. Kickoff in College Station is set for 11:35am and will be broadcast regionally by the 40-plus station Texas A&M Radio Network and will be televised by Versus. HOUSTON, TEXAS (September 26, 2008) The Rice Owls volleyball team (8-2, 0-0) begins Conference USA league action this weekend on the road. The Owls are at UTEP (4-9, 0-0) on Friday at 8 p.m. (Central) in El Paso, Texas, and at Tulane (8-4, 0-0) on Sunday at 1 p.m. in New Orleans, La. Rice swept the competition in winning the BGSU Best Western Invitational in Bowling Green, Ohio. The Owls defeated Hofstra 3-1, host Bowling Green 3-1, and Binghamton 3-0. Karyn Morgan was named MVP, while Jessica Holderness, and Tracey Lam were all-tournament selections. This was the Owls' first competition since the Baylor Classic (Sept. 5-6) as the SFA Ladyjack Invitational was canceled due to Hurricane Ike. 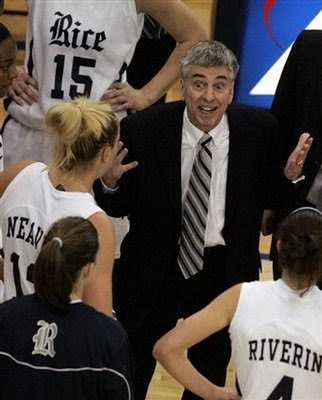 Rice head coach Genny Volpe sports a school and overall coaching mark of 72-55 (5 years; .567). She led the Owls to their first-ever NCAA appearance in 2004. Rice is 2-2 in opening conference matches under Volpe. Several Owls are among the NCAA's statistical leaders through matches played Sunday, Sept. 21. Sophomore setter Meredith Schamun leads C-USA and is ranked fifth in the nation in assists per set at 11.63. Rice, as a team, is ranked ninth in the NCAA with 14.34 kills per set. Sophomore libéro Tracey Lam ranks first in C-USA and 18th in the country with 5.00 digs per set. She has 175 digs in 35 sets. Junior Natalie Bogan is 20th in the nation and second in C-USA with a .398 attack percentage (100-18-196). Three Rice Owls have accumulated 100 or more kills through 10 matches. Senior Karyn Morgan leads at 118, while Jessica Holderness as 101 kills, and Natalie Bogan has 100. Rice is 19-8 all-time vs. UTEP after sweeping the Miners three times last season by 3-0 counts. Tulane holds a slight 9-8 edge over the Owls in the all-time series. The Green Wave captured all three meetings a year ago vs. Rice. The Owls host C-USA rival SMU on Friday, Oct. 3 at 7 p.m. and Tulsa on Sunday, Oct. 5 at 1 p.m.
WEST POINT, NEW YORK (September 26, 2008) For the first time this season, the Army football team will don the white jerseys. After opening the season with three home games and a bye week, the Black Knights will play at Texas A&M Saturday afternoon at Kyle Field in College Station, Texas. The game will be carried live by Versus and the Army Radio Network. Kickoff is scheduled for 12:38 ET. Army, 0-3, is expected to play in front of a large crowd that could top 80,000 as Texas A&M tries to even its mark at 2-2. The game will mark a homecoming of sorts for the 22 players on the Black Knights roster who hail from the talent-rich state of Texas. The Black Knights will look to get on track offensively and post their first win of the season following setbacks to Temple, New Hampshire and Akron. The Aggies, under former Green Bay Packers coach Mike Sherman, opened the season with an 18-14 loss to Arkansas State and then beat New Mexico, 28-22. A loss to Miami, 41-23, dropped their mark to 1-2. Army has utilized three quarterbacks this season, all who have had some success. Junior Carson Williams (6-3, 212) has started all three games. He has completed 19 of 32 passes for 221 yards with a touchdown and pair of interceptions. Sophomore Chip Bowden (6-0, 218) has connected on one pass but has rushed 35 times for 104 yards. Senior Carlo Sandiego (5-6, 176) is a third option and has carried six times in three games. Texas A&M has not listed a starting quarterback and both Stephen McGee and Jerrod Johnson are expected to play, if healthy. McGee, a 6-3, 207-pound senior, has played in two games and connected on 22 of 32 passes for 190 yards. He has two interceptions. A junior, Johnson (6-5, 229) has played in all three games and completed 29 of 51 passes for 399 yards and six touchdowns. Army fullback Collin Mooney (5-10, 247) grew up about 90 minutes from College Station and will return to his home state as the team’s leading rusher with 52 carries for 174 yards. Wesley McMahand (5-5, 177) has 64 rushing yards while Tony Dace (5-6, 187) has 40. Robert McClary (5-11, 247), Bryson Carl (6-0, 256), Patrick Mealy (5-8, 203), Justin Turner (5-8, 197) and Jameson Carter (5-11, 187) may also factor into the running games. Texas A&M counters with a huge fullback of its own in Jorvrskie Lane, a senior who is listed at 6-0, 270. He has rushed seven times for 19 yards. Junior Mike Goodson (6-0, 196) is the team’s leading rusher with 42 carries for 200 yards and a pair of touchdowns. Freshman Cyrus Gray (5-10, 188) is second on the squad with 19 carries for 56 yards. Carter, a sophomore, tops the Black Knights receiving charts with six catches for 112 yards. Sandiego has four catches for 53 yards while senior Mike Wright (6-2, 218) has three catches for 32 yards. Five others have at least one reception. Goodson also leads the Aggies in receiving with 12 grabs for 114 yards and two touchdowns. Freshman Jeff Fuller (6-4, 209) has 11 catches for 137 yards and three touchdowns while Ryan Tannehill (6-4, 204) has eight caches for 116 yards. Brock praised the offensive line for its improvements between weeks two and three and will look for even more production out of the veteran group. Senior Trey Miranne (6-0, 273), is surrounded by senior guards Mike Lemming (6-3, 298) and Brandon Cox (6-3, 294) and junior tackles Jason Johnson (6-2, 260) and Ali Villanueva (6-10, 302). Texas A&M averages more than 300 pounds across its offensive line, led by junior guard Lee Grimes who is listed at 6-6, 339 pounds. Evan Elke (6-4, 303) is the other guard and they are joined by center Kevin Matthews (6-4, 297) and tackles Travis Schneider (6-8, 290) and Michael Shumard (6-5, 301). Army is allowing just 140 rushing yards per game and only 169 through the air. End Fritz Bentler (6-3, 235) and Victor Ugenyi (6-3, 253) are joined in the 4-3 defense by tackles Ted Bentler (6-2, 280) and Mike Gann (6-2, 270). Gann has 10 tackles, a sack and 1.5 tackles for loss while Ugenyi has been credited with five stops. Marcus Hilton (6-0, 252), Joe Paolini (6-0, 264), Mark Faldowski (6-3, 235) and David Shore (6-5, 253) could also factor in on the defensive line. The Aggies are allowing 210 rushing yards per contest and 184 passing yards and also play a 4-3 defense. Seniors Michael Bennett (6-4, 261), Amos Gbunblee (6-5, 250) and Cyril Obiozor (6-4 264) comprise the rotation at end with Lucas Patterson (6-4, 297) and Tony Jerrod-Eddie (6-5, 256) at the tackle spots. Bennnet has a team-best 4.5 tackles for loss and has 18 tackles. Three of Army’s top-four tacklers are linebackers. Josh McNary (6-1, 231) is the team leader with 25 tackles and three tackles for loss. John Plumstead (5-10, 222) is third with 19 tackles while Frank Scappaticci (6-1, 224) has 17. Two juniors, Matt Featherston (6-2, 235) and Anthony Lewis (6-2, 254) share the middle linebacker duties and Featherston leads the team with 32 tackles. Garrick Williams (6-2, 217), Jonathan Haynes (6-2, 204), Von Miller (6-3, 214) and Derek Dumas (6-0, 221) are the outside linebackers for the Aggies. Army’s secondary has two interceptions and has limited opponents’ passing yardage to less than 170 per game. Senior Lowell Garthwaite (6-1, 207) is the second leading tackler with 20 and has two pass breakups and a pair of forced fumbles. Sophomore Donavan Travis (6-1, 187) is the other safety with Jordan Trimble (5-10, 183) and Mario Hill (6-0, 182) at the corners. The Aggies have five returning starters back in the secondary. Corners Arkeith Brown (6-0, 174), Danny Gorber (6-0, 173) and Jordan Pugh (5-11, 191) all have starting experience and Brown has one of the team’s three interceptions. Alton Dixon (5-11, 197) and Devin Gregg (6-0, 190) are listed as returning starters at “rover” while Jordan Peterson (5-10, 184) is the safety. Matthew Campbell (5-9, 195) is averaging 53.7 yards per kickoff for the Black Knights while Andrew Rinehart (6-1, 217) averages 37.5 yards per punt. Carter, Sandiego and Mealy have all returned punts or kicks. Sandiego has five punt returns and six kickoff returns while Mealy and Carter have each returned five kicks. Justin Brantly (6-3, 241) averages 46 yards punt for Texas A&M while Richie Bean (5-11, 172) averages 69.2 yards on kickoffs. Jordan Pugh (5-11, 191) has returned seven punts for 60 yards and Cyrus Gray (5-10, 188) has 10 kick returns for 167 yards. Army will continue its two-game road trip next weekend at Tulane. DURHAM, NORTH CAROLINA (September 25, 2008) Baylor right-handed pitchers Kendal Volz and Shawn Tolleson were two of 25 student-athletes listed as Baseball America's top college prospects for the 2009 Major League Baseball First-Year Player, the publication announced Friday. Baylor joined North Carolina, Oklahoma State, California and LSU as the only programs with two players on the list. Volz, who was 3-6 with a 4.20 ERA last season, ranked sixth on the Baseball America list. He led the Bears with 85 strikeouts over 70.2 innings and ranked 17th nationally in strikeouts per nine innings. Volz raised his stock significantly during the summer, converting eight saves in as many opportunities with a 0.00 ERA for the USA Baseball National Team. Tolleson, who posted a 6-4 record last season with a 5.04 ERA, ranked 23rd on the Baseball America list and was the third-highest rated sophomore. He had 63 strikeouts over 78.1 innings and tossed two complete-game shutouts. Tolleson is draft eligible due to sitting out the 2007 season as a redshirt. HOUSTON, TEXAS (September 24, 2008) The University of Houston soccer team dropped a tough 2-1 decision to cross-town rival Houston Baptist on Tuesday at Robertson Stadium. Houston (4-3-0) dominated the play much of the game, maintaining the majority of the possession and outshooting the Huskies 22-7, but could just not finish. “We outshot our opponents,” Head Coach Susan Bush said. “They had two good opportunities and finished them both. Our finishing is still an issue. Freshman Ashlee Briggerman scored her first career goal in the 82nd minute to bring Houston within striking distance. Briggerman tallied the Cougar’s lone score in the air, heading fellow freshman Stephanie Derieg’s corner kick into the back of the net. In one of the Cougars’ best chances of the night, freshman Ryan Bruz blasted a shot from the left side of the penalty area and could only watch as it ricocheted off the post and cleared out of danger. Sophomore Islara Rodriguez ripped a team-high five shots in the contest, while junior Kaitlin Thulin added four. HBU scored in the 15th minute when Ana Viscariello put away a rebound in front of the goal to give the Huskies a 1-0 lead. HBU would double its lead in the 47th minute when Viscariello put away her second goal of the game. Freshman goalkeeper Lauren Frazier made her first career star for UH, allowing a pair of goals and recording a pair of saves during the contest. “We are heading into conference play on Friday, and Frazier needed to get some in-game experience in case we need her,” Bush said. Houston opens conference play against Marshall and East Carolina on Friday and Sunday, respectively. “We are looking forward to opening the conference schedule,” Bush said. “We have the players to do well, but there is no easy game. Our goal is still to make the Conference Tournament. OKLAHOMA CITY, OKALHOMA (September 24, 2008) You have followed them passionately and loyally the past year and now its time to catch up with the 2008 USA Softball Women’s National team to see what they have been doing after spending the past nine months on the road and winning a silver medal at the 2008 Olympic Games in Beijing, China. Although Crystl Bustos (Canyon Country, Calif.) retired her cleats, her presence on the softball field is still known as she is still busy with camps and clinics while also trying to grow her non-profit agency, dedicated to help low-income family pay fees, dues and for equipment so they can be involved in sports. Four-time Olympian Laura Berg (Santa Fe Springs, Calif.) and two-time Olympian Jennie Finch (La Mirada, Calif.) are both keeping busy giving lessons and hosting camps and clinics. Kelly Kretschman (Indian Harbour Beach, Fla.) is also on the circuit giving lessons and helping out at camps and clinics. Several from the team are now outside of the lines as coaches. Cat Osterman (Houston, Texas) is in her second season as an assistant coach at DePaul University while Lauren Lappin (Anaheim, Calif.) joins Osterman in Chicago as a volunteer coach at Northwestern University. Osterman is also beginning her classes to get her MBA from DePaul. Both Tairia Flowers (Tucson, Ariz.) and Vicky Galindo (Union City, Calif.) are entering their second season as assistant coaches at Long Beach State and San Jose State University, respectively. Making her debut in the collegiate coaching ranks is Stacey Nuveman (La Verne, Calif.) who will serve as an assistant coach for the San Diego State University softball program. Monica Abbott (Salinas, Calif.) is working on finishing her degree at the University of Tennessee and is also putting on the Monica Abbott All Star Softball Clinics. Caitlin Lowe (Tustin, Calif.) is also working on finishing her degree at the University of Arizona while Andrea Duran (Selma, Calif.) is spending time on the PFX Tour. Lovie Jung (Fountain Valley, Calif.), who also retired her cleats after her second Olympic experience, is on track to become a fire fighter in the state of California. Natasha Watley (Irvine, Calif.) is at her alma mater, UCLA, for her fifth season as a volunteer assistant coach. Jessica Mendoza (Camarillo, Calif.) is currently in Europe with former head coach Mike Candrea (Tucson, Ariz.) conducting clinics in both London and Italy. USAsoftball.com recently received a blog from Mendoza on her experience. “Coach Candrea and I have just spent the last three days doing clinics throughout the London, England area and it has been an experience of a lifetime. Our first day started off speaking to coaches from all over the world … from Argentina, Bolivia, the Netherlands, Spain, Venezuela, Israel, Belgium, France, and of course the UK. Anyone who thinks softball is not an international sport should have been in this room! We then spent the next three days, from about 9 am to 9 pm every day, talking/presenting to coaches and doing clinics for players ranging from ages 12-30. The attitudes and enthusiasm these young women brought out to the field each day was remarkable and it was so fun to get a glimpse of the softball atmosphere here in England. We shared a lot of laughs because they thought Coach Candrea and my "accents" were really funny and there are a lot of American English words that got sort of "lost in translation" when heard as British English. To be honest, we spent so much time and shared so much with these amazing players and coaches that when it came time to say goodbye, it felt like it had been months we had known and worked with them. It was inspiring for Coach Candrea, Ronnie Isham (Director of national teams) and myself to truly see how vast the softball community is, and how much passion for the growth of this game exists globally. Bob Fromer, Hayley Scott and Mike Jennings were the main people from Baseball Softball UK that not only made this possible, but made it an experience none of us will ever forget. Mendoza has been active participating in the PFX Tour and will take over as President of the Women's Sports Foundation on January 1, 2009. Candrea will return to the University of Arizona to attempt to lead the Wildcats to a third National Championship in four years. Candrea retired from the USA Softball program after leading the team to a silver medal finish at the 2008 Olympic Games. USA Softball is the brand created, operated and owned by the ASA that links the USA Men’s, Women’s, Junior Boys’ and Junior Girls’ National Team programs together. USA Softball is responsible for training, equipping and promoting these four National Teams to compete in international and domestic competitions. The USA Softball Women’s National Team is one of the only two women’s sports involved in the Olympic movement to capture three consecutive gold medals at the Olympic Games since 1996. The U.S. women have also won eight World Championship titles including the last six consecutive as well as claimed two World Cup of Softball titles. 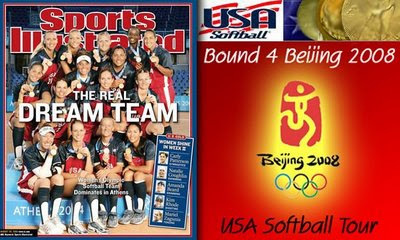 For more information about USA Softball, please visit http://www.usasoftball.com/. HOUSTON, TEXAS (September 23, 2008) The University of Houston soccer team returns to action at 6 p.m., Tuesday, when the Cougars open a five-game homestand against cross-town rival Houston Baptist at Robertson Stadium. The game was added to the schedule late last week after UH had a pair of games cancelled due to Hurricane Ike and its aftermath. This weekend the Cougars split a pair of games on the road, winning at Texas State 1-0 on Friday before dropping a 1-0 decision to Baylor in Waco on Sunday. Senior goalkeeper Shelby Scott has provided the Cougars with a steady presence in net this season, solidifying the team’s backline. Scott has allowed only three goals in more than 551 minutes of action, recording a streak of 373 consecutive scoreless minutes before the Bears’ goal on Sunday. The Cougar captain currently leads Conference USA with a goals against average of 0.49. Freshman Jessica Zavalza has made an immediate impact on the field in her rookie campaign, leading the team with three goals scored and six points. Houston won the only regular season match-up between the two programs, notching a 3-1 win at home in 2007. Following Tuesday’s match, the Cougars will open conference play next weekend when they face Marshall and East Carolina at home on Friday and Sunday, respectively. SAN MARCOS, TEXAS (September 22, 2008) Texas State senior linebacker Courtney Smith was named the Southland Conference Defensive Player of the Week in a poll of SLC Sports Information Directors on Monday, Sept. 22. Smith the Southland Conference announced its football players of the week on Monday. Smith led Texas State with 12 tackles, including nine solo stops, in the 38-35 victory at Northern Colorado. The senior from Statesboro, Ga., also registered one sack (-8 yards) and intercepted a pass and returned it 9 yards. His biggest play of the day came with 19.2 seconds left at Texas State’s 1-yard line when he forced a fumble by Northern Colorado quarterback Bryan Waggener and the Bobcats recovered to preserve the victory and give Texas State its first non-conference road game since 2001, a span of 13 games. In addition, Southeastern Louisiana wide receiver Andre Cryer was named the league’s offensive player of the week, while Nicholls State return man Lardarius Webb was named the player of the week on special teams. Texas State’s Andrew Ireland was the runner-up for the special teams award after he made all five of his extra-point attempts and kicked the game-winning, 29-yard field goal with 2:11 remaining to play. Each school’s sports information director nominates and votes for the players of the week, though is not permitted to vote for his own player. Both Ireland and Smith will be in action this Saturday night when the Bobcats return home to play host to Southern Utah at 6:00 p.m. on the Jim Wacker Field at Bobcat Stadium. The victory over Northern Colorado gives Texas State a 2-1 record this season and that is the best start for the Bobcat football team since 2005 when Texas State opened the year with a 6-1 mark. NEW YORK, NEW YORK (September 22, 2008) The Houston Dynamo will play CD Luis Angel Firpo on Wednesday, 26 November, to replace the CONCACAF Champions League™ match that was postponed due to Hurricane Ike. Ike struck Houston on the morning of 13 September, causing flooding, wind damage and power outages across the metropolitan area and forcing the match on 17 September to be delayed. The Dynamo also had to postpone its Saturday league match against the San Jose Earthquakes, citing the apprehension of city officials who were still looking to restore street lights in some sections and were concerned about public safety. 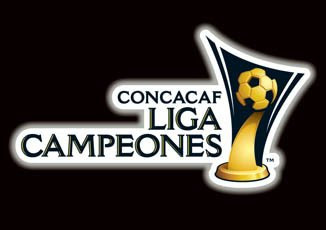 The CONCACAF Champions League™ match will be played at Houston’s Robertson Stadium at 7 p.m. local time three days after the USA’s MLS Cup championship game in Los Angeles and three days before the 18th and final round of the El Salvador's Apertura season. 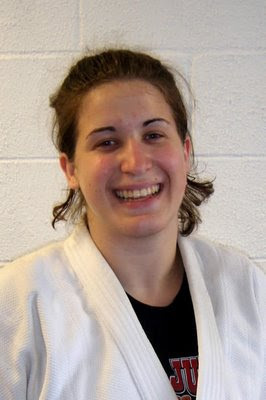 COLORADO SPRINGS, COLORADO (September 22, 2008) In the first major international tournament since the Olympic Games, Nina Cutro-Kelly (San Antonio, Texas / Universal Judo) won the first A-Level medal of her career with a silver at the Birmingham World Cup in Great Britain on Saturday. Cutro-Kelly’s first two wins avenged losses to players she fought last year at the 2007 Finnish Open. In the first round, Cutro-Kelly led by a koka (smallest points) when Emma Fletcher (GBR) sustained a knee injury that forced her to withdraw from the match. The win moved Cutro-Kelly into the semifinal when she and Raimonda Gedutyte (LTU) fought into overtime before Cutro-Kelly pinned Gedutyte. Although Cutro-Kelly sustained an injury during her final match against Jana Stucke (GER), she continued fighting until Stucke armbarred her for the win. The silver medal moves Cutro-Kelly into the #1 ranking in the 78kg division in the United States and makes her one of only three players in the United States to be currently ranked as an A-Level athlete. HOUSTON, TEXAS (September 22, 2008) The Gulf LSC held its annual awards banquet this past Sunday at the Marriott Westside Hotel in Houston. Olympian Jason Lezak spoke to the attendees about his Olympic experience in Beijing and the commitment it takes to make one's goals a reality. Clayton Cagle of the Cypress-Fairbanks Swim Club (CFSC) was honored as the Coach of the Year and Shane McCauley of Premier Aquatics Club of Klein (PACK) was selected as the Age Group Coach of the Year. Ryan Littlefield of First Colony Swim Team (FCST) was bestowed with the Pauline Phillips Award, while Ron Lusk (PACK) was honored as the Robert Stallings Official of the Year. Rick Tobin was recognized with the ConocoPhillips Outstanding Service Award. Gulf Swimming is the governing body for competitive swimming in the Gulf Coast Area of Texas, and is a member Local Swimming Committee (LSC) of USA Swimming, the national governing body for swimming as recognized by United States Aquatic Sports (The United States=2 0Member of "La Fédération Internationale de Natation", or FINA) and the United States Olympic Committee. ITTA BENA, MISSISSIPPI (September 22, 2008) Prairie View A&M University quarterback Mark Spivey had a spectacular night against Mississippi Valley State on Saturday, Sept. 20th, as he threw for 260 yards and four touchdowns and also ran in for a score. Three of those TD strikes were to PVAMU wide receiver Shaun Stephens. Stephens had a breakout game catching touchdown passes from 15, 10, and 8 yards out as he went on to post a total of four receptions for 78 yards with a long of 45 yards. Defensively the Panthers continued their stellar play as they limited MVSU to just 35 yards on the ground and 151 yards passing. Zach East led the way with a total of seven stops and 1.5 tackles for lost. Riante Jones and Val Ford each tallied an interception as the Panthers forced two turnovers. Prairie View A&M running back Russell Ball made his Panthers debut in the backfield rushing the ball five times for 27 yards and one touchdown. Donald Babers added 50 yards on 16 carries with one touchdown. The Panthers led the ball game by the score of 29-7 going into the fourth quarter. PVAMU went on to erupt for 20 points in the last 15 minutes of regulation as they never took their foot off of the gas pedal in what was the Panthers most convincing win over MVSU in several decades. The victory puts the Panthers off to a 3-0 start for the first time since 1964, which is the last year the program captured a Championship title in football. WACO, TEXAS (September 21, 2008) The University of Houston soccer team dropped a 1-0 decision to Baylor in Waco on Sunday, snapping the Cougars four-game winning streak. Houston (4-2-0) lost for the first time since its 1-0 double-overtime defeat to UTSA in the season opener on Aug. 22. Baylor’s Christine Clark put away the game-winner in the 69th minute, tallying the game’s only goal off a rebound in front of the net. The goal broke a 373 minute scoreless streak for senior goalkeeper Shelby Scott. It was only the third goal allowed in more than 551 minutes of action this year for Houston’s captain. Scott currently leads Conference USA with a 0.49 goals against average. The Cougar offense outshot the Bears 12-7, tallying nine shots in the second half. Houston also won eight corners in the match but could not find the back of the net. Junior midfielder Kaitlin Thulin led Houston with four shots, while freshman forward Jessica Zavalza ripped three shots. Houston returns to action at 6 p.m., Tuesday, when the Cougars open a five-game home playing host to cross-town rival Houston Baptist at Robertson Stadium. LAFAYETTE, LOUISIANA (September 21, 2008) The Rice men's tennis completed the opening weekend of the fall season Sunday at the Ramada Inn-LCVC ULL Fall Invitational. Vishnu Rajam resumed his B Flight quarterfinal match at 2-2 in the third set against Oscar Machuca of Southern Miss. Maschuca won four of five game to claim 7-6 (2), 4-6, 6-3 victory. Tobias Scheil's bid for the A Flight finals came up short as top-seeded Piotr Banas of ULL edged out a 7-5, 6-4 win. The Owls head to the Baylor Invitational next weekend. LAFAYETTE, LOUISIANA (September 20, 2008) Tobias Scheil notched a pair of straight-set victories and advanced to the A Flight singles semifinals Saturday at the Ramada Inn-LCVC ULL Fall Invitational. Scheil took down Nicholls State’s Eric Fischer 6-3, 6-1 before dismissing LSU’s Jonathan Tragardh by the count of 6-4, 6-3. Down a set and a break, Dennis Polyakov rallied to turn the tables on ULL’s Piotr Olechowski. The Houston native won 12 of the last 13 games for the 5-7, 6-3, 6-1 triumph. Polyakov’s bid for the semifinals fell short as Memphis’ Jorge Vasquez picked up a 6-1, 6-2 win. In the B singles flight, Vishnu Rajam knocked off LSU’s David Roberts 6-4, 6-3. Rajam’s quarterfinal match against Oscar Machuca of Southern Miss was paused at 6-7 (2), 6-4, 2-2 due to rain. Singles action continues Sunday, while doubles play has been cancelled. AUSTIN, TEXAS (September 19, 2008) The 2009 Austin Marathon will bear the name of a new title sponsor as the two-year contract with AT&T has ended. AT&T helped elevate the race to sold-out capacities in both 2007 and 2008 and introduced music and technology elements never before seen in the event. "Every race or major event experiences title sponsor changes," said Austin Marathon race director and Conley Sports founder, John Conley. "We hate to say goodbye to a great sponsor like AT&T, but we know this gives us an opportunity to bring a new personality into the race, and once again improve our event." The Austin Marathon event organizers at Conley Sports plan to build on the longtime support of returning sponsors like Seton Family of Hospitals, Coca-Cola, H-E-B and Oroweat, all of whom play critical roles in making the race happen for approximately 12,000 runners and 30,000 spectators each year. "We're lucky to have a very solid group of long-time sponsors in Seton, Coca-Cola, H-E-B and Oroweat," Conley said. "Their sustained contributions have made the Austin marathon a destination race for runners across the U.S."
Sponsorship discussions are a year-round activity for any event like the marathon. The race can now officially open up those discussions to include title sponsorship consideration. A new title sponsor brings the opportunity for the race to further benefit both participants and spectators. HOUSTON, TEXAS (September 18, 2008) The University of Houston soccer team returns to action at 7 p.m., Friday, as the Cougars square off against Texas State in San Marcos. Houston (3-1-0) has not played since its 2-0 win over Louisiana-Lafayette on Sept. 5. The team’s games against No. 10 Texas and LSU - scheduled for last weekend - were cancelled due to Hurricane Ike. “The storm gave the girls five days off, which is really more time then we would ever like them to have,” head coach Susan Bush said. “But everyone is ok and the team is in good spirits. “What I will be looking for is how our team responds after not playing at all last weekend. These two games are very important to us. Freshman Jessica Zavalza has gotten off to a great start in her rookie campaign, leading the team with three goals and six points just three games into her collegiate career. Zavalza ranks among the Conference USA leaders in several offensive categories including first in goals per game, points per game and game-winning goals. Senior captain goalkeeper Shelby Scott has been solid in net for UH, allowing only two goals in more than 371 minutes of action for a C-USA best 0.48 goals against average. Scott also ranks second in C-USA with a .875 save percentage. Fans can follow live stats from the match by logging on to TXStateBobcats.com. The Cougars hold a 5-1-0 all-time record against the Bobcats and are 2-1 on the road in San Marcos. Following Friday’s match, the Cougars will head on to Waco where they will face Baylor at 1 p.m., Sunday. Houston trails the all-time series 1-2 but posted a 2-0 win over the Bears last season in Houston. A free live audio broadcast of Sunday’s game will be available at BaylorBears.com. For more information, consult the webpage. Fans also can follow live stats from the match at the Baylor Athletics webpage. SAN MARCOS, TEXAS (September 18, 2008) The world-renowned Strutters, who are celebrating their 49th year of excellence, will make their 2008-09 début this Saturday night, Sept. 20th, at the annual “Meet the Strutters” performance at 7:00 p.m. in Strahan Coliseum. In conjunction with their debut, San Marcos mayor Susan Narvaiz declared Sept. 20, 2008, as “Meet the Strutters Day” at the latest San Marcos City Council meeting. “The Strutters have served as ambassadors for city and brought recognition to San Marcos for nearly 50 years,” Mayor Narvaiz said. She also thanked them by presenting the Strutters with the Key to the City. In addition to the performance, a silent auction will be held on the concourse of the Coliseum. Items being auctioned off include: week-long vacation packages to Playa del Carmen and the Tamarron Resort in Durango, Colo., NBA game tickets to the San Antonio Spurs and Dallas Mavericks, white water sports packages, tubing packages, collector books, several rounds of golf, gift certificates, jewelry, paintings, a Texas State quilt, iPods and more. The Strutters will hold a garage sale in the Strahan Coliseum commuter lot from 8 a.m.-noon on Saturday. The proceeds from the silent auction and garage sale go toward financing the Strutters’ spring break tour to Chile. All three events are free for the entire family. Founded in 1960, the the 79-member precision dance team under the direction of Susan Angell-Gonzalez, performs at Texas State intercollegiate athletic events and have held performances in 22 countries in four continents. The Texas State Strutters recently represented Texas State University and the City of San Marcos in the NBC network television program, “America’s Got Talent,” and reached the live semifinal round of competition. HOUSTON, TEXAS (September 17, 2008) The Rice Owls volleyball team (5-2) competes Friday and Saturday at the BGSU Best Western Invitational in Bowling Green, Ohio. The Owls will face Hofstra (5-5), host Bowling Green (9-2), and Binghamton (3-8). Fri. - vs. Hofstra, 3:30 p.m. Sat. - at Bowling Green, 11:30 a.m. Sat. - vs. Binghamton, 3:30 p.m.
Rice is 0-1 vs. Hofstra, losing 3-1 in 1985. It will be the first-ever meeting for Rice vs. Bowling Green and vs. Binghamton. This is the Owls' first competition since the Baylor Classic (Sept. 5-6) as last weekend's SFA Ladyjack Invitational was canceled due to Hurricane Ike. At the Baylor Classic, Rice went 2-1 with wins over UT-San Antonio (3-1) and Weber State (3-0), and a 3-1 loss to Baylor. The season began with Rice posting a 2-1 record at its own Mizuno Invitational with 3-0 victories against UT-San Antonio and Louisiana-Lafayette and a 3-0 loss to Michigan. Natalie Bogan leads Rice with a .361 hitting percentage (63-11-144), while Karyn Morgan holds team honors with 79 kills for a kills per set of 3.29. Setter Meredith Schamun directs a balanced attack with 267 assists (11.12) and libéro Tracey Lam averages an outstanding 5.17 digs per set (124). Rice head coach Genny Volpe sports a school and overall coaching mark of 72-55 (5 years; .567). Rice's next home match is vs. C-USA rival SMU on Oct. 3 at 7 p.m.
HOUSTON, TEXAS (September 16, 2008) The Rice Invitational men's and women's cross country meet scheduled for Saturday, Sept. 20 has been canceled due to Hurricane Ike. The 34th annual event will not be rescheduled. Jim Bevan's women's team won last year's Texas A&M Invitational as the Owls placed 1-3-6-8, with Marissa Daniels winning the event. HOUSTON, TEXAS (September 15, 2008) The Rice football team landed at Bush Intercontinental Airport and returned to campus a little before 5pm Monday. Head coach David Bailiff has indicated that should classes resume on Tuesday, the squad will attempt to pick up the normal schedule of practices as they continue preparations for Saturday's game with No. 7 Texas Texas in Austin. In a related development, the weekly Extra Point Club dinner schedule for tonight in the R Room has been canceled. ATHENS, GEORGIA (September 14, 2008) The TCU women's tennis team wrapped up the third day of the Bulldog Invitational on Sunday, going undefeated on the day in doubles and earning victories in five of eight singles matches. Freshmen Kayla Duncan and Gaby Mastromarino completed their first collegiate tournament, going undefeated in both singles and doubles action. The pair teamed to go 4-0 in doubles over the weekend, including a win Sunday over Wake Forest’s Christian Tara and Emilee Malvehy, 8-2. Duncan and Mastromarino also each earned singles wins Sunday. In the other doubles wins for TCU, the senior duo of Macall Harkins and Anna Sydorska topped Sasha Kulikova and Sierra Poske from Wake Forest, 8-2, while sophomores Katariina Tuohimaa and Idunn Hertzberg got the best of Katarina Reveche and Ryan Cutillo, 9-8 (6). Nina-Munch Soegaard and Maria Babanova completed the doubles sweep by knocking off Virginia’s Jennifer Stevens and Emily Fraser, 8-6. In singles play, Munch-Soegaard battled back to defeat Nadja Gilchrist, 2-6, 6-3, 6-4, while Harkins picked up her win over Emilee Melvehy, 6-4, 6-2. Hertzberg finished up her weekend with a win over Indiana’s Stephanie Heller, 4-6, 7-5, 1-0 (10-2). TCU will return to action as six members will take part in the 2008 Riviera/ITA All-American Championships in Pacific Palisades, Calif., Sept. 27–Oct.5. HOUSTON, TEXAS (September 13, 2008) Rice Owls volleyball setter Meredith Schamun (Murrieta, Calif./Vista Murrieta HS) currently ranks 17th in the nation in assists per set. The sophomore is averaging a league-leading 11.13 assists per set. Schamun has 267 assists in 24 sets. The Owls will next be in action on Sept. 19 vs. Hofstra at the BGSU Best Western Invitational in Bowling Green, Ohio. HOUSTON, TEXAS (September 12, 2008) Ahead of Hurricane Ike, Rice University's golf team has journeyed to Lawrence, Kan., for next Monday and Tuesday?s 2008 Kansas Invitational. The 54-hole tournament is set for Alvamar Golf Club (par-72, 7058 yards) in Lawrence. Teams are slated to play 36 holes on Monday and 18 holes Tuesday. Four Rice players who competed at the San Francisco Invitational earlier this week (senior Kyle Kelley, junior Michael Buttacavoli and sophomores Michael Whitehead and Robert Burrow) will compete next week. Rounding out the Rice five-player field is freshman Erik Mayer who will compete in his first collegiate tournament. Houston was expected to defend its 2007 title but pulled out of the tournament this week. The 15-team field will include host Kansas, Illinois State, Louisiana-Lafayette, Nebraska, TCU and UC-Davis. Rice is coming off a 14th-place finish at the San Francisco Invitational earlier this week. Whitehead and Buttacavoli were the Owls' top-finishing golfers last week, each finishing with three-round scores of 225 to tie for 42nd at the Olympic Club. The Owls flew out of Houston early Friday morning and are in Lawrence. Practice rounds are slated for Sunday at Alvamar Golf Club. DALLAS, TEXAS (September 11, 1008) The names that graced the hallowed grounds at Texas Stadium over the years could fill an entire wing at the Pro Football Hall of Fame. Roger Staubach, Tom Landry, Tex Schramm, Randy White, Bob Lilly, Michael Irvin, Emmitt Smith, Tony Dorsett, Mel Renfro and Troy Aikman. They all left their mark inside Texas Stadium, the home of the Dallas Cowboys which is closing out a historic run this season. It was a venue that visiting NFL teams feared—or at least paused to think about when entering and staring at that big Cowboys Blue Star logo at midfield. And sometimes the sunshine that penetrated the opening in the roof played into the home team’s hands as well, driving visiting quarterbacks and their receivers a bit blind at times. Home field advantage? You better believe it. While the new house that owner Jerry Jones built is already the talk of the league, leaving behind Texas Stadium and all the history promises to bring a few tears to Cowboys fans during the 2008 season that kicks off at home against Philadelphia on Monday night, September, 15. The memories will linger on, however, thanks to a very nice full-sized, limited edition football that Nikco Sports announced it will be marketing, a project that will also put some smiles on the faces of many youngsters who are battling life-threatening medical conditions and who depend on the support of the Make-A-Wish Foundation of North Texas. In recent years, Nikco Sports has raised almost $1.7 million for children’s charities and some of that has come from projects involving the Cowboys, Texas Rangers, Dallas Mavericks and San Antonio Spurs, along with a Hall of Fame project for Troy Aikman. Only 2,008 footballs will be produced for $99 each. This historic piece of memorabilia includes a stunning acrylic display case and can be purchased by calling 1-800-345-2868 or visiting www.nikcosports.com. Each football will come with a numbered certificate of authenticity to enhance its future value. With the holiday gift season about to soon begin, this promises to be a special item for Cowboy fans this autumn. 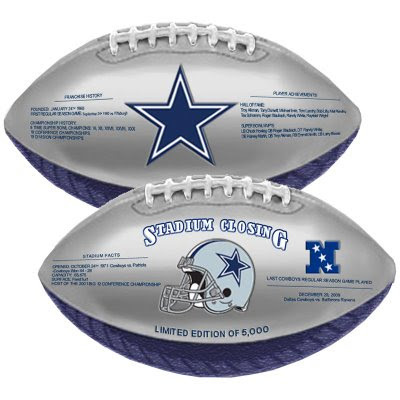 Each fully licensed football features two silver and two blue panels and will include the official Cowboys team logo, along with a number of historic team facts printed on the panels, information that fans can look back on in future years to remember the special feeling that Texas Stadium provided to them. One of the football’s silver panels will present information about the Cowboys franchise history along the left side, and includes a listing of their 5 Super Bowl titles, 10 conference championships and 19 division championships. The heralded Cowboys Blue Star Logo is positioned in the center, and to the right is a listing of Cowboy players inducted into the Pro Football Hall of Fame, along with a listing of Super Bowl MVPs. The second silver panel chronicles Texas Stadium facts on the left side, including the date of the first game played there—October 24, 1971 against the New England Patriots, a game the Cowboys won, 44-28. In the center of this panel is the traditional Cowboys helmet logo, and to the right will be listed the final regular season game at the stadium against the Baltimore Ravens on December 20. Above all this information is a banner that reads Stadium Closing. Many of Nikco Sports’ projects have honored amateur and professional teams (Super Bowl, World Series, NBA, NHL, NASCAR and NCAA) and have recognized some of the greatest athletes in America, such as (baseball) Ozzie Smith, Mark McGwire, Kirby Puckett, Ryne Sandberg, Randy Johnson, Paul Molitor, Pedro Martinez, Greg Maddux, Roger Clemens, Cal Ripken, Jr., Jim Thome, Adam Dunn, Nolan Ryan, Ken Griffey, Jr. and Edgar Martinez; (football) Peyton Manning, John Elway, Dan Marino, Troy Aikman, Jim Kelly, Jerome Bettis, Ben Roethlisberger, Carson Palmer, Steve Young, Brett Favre, Emmitt Smith and Kurt Warner; (basketball) Magic Johnson, LeBron James, John Stockton, David Robinson, Michael Jordan and Isiah Thomas; (motor sports) Jeff Gordon, Tony Stewart, Dale Earnhardt and Dale Earnhardt, Jr.; (hockey) Brett Hull; (golf) Tiger Woods. The Make-A-Wish FoundationÒ of North Texas grants the wishes of children with life-threatening medical conditions to enrich the human experience with hope, strength and joy. The Make-A-Wish Foundation is the largest wish granting organization in the world. There are presently 72 chapters in the United States and its territories and 27 international affiliates. More than 150,000 wishes have been completed since 1980 for children around the world. HOUSTON, TEXAS (September 10, 2008) With Hurricane Ike bearing down on the Gulf Coast, the University of Houston soccer team’s match against the No. 8 Texas Longhorns will be moved up to 7 p.m. on Thursday in Austin, school officials announced on Wednesday. The Cougars’ game at LSU scheduled for Sunday will also be moved, with UH heading to Baton Rouge, La. on Tuesday, Sept. 16. A game time has yet to be determined. Houston (3-1-0), winners of its past three contests, opens a challenging four-game road trip this week. "We still need to improve on things offensively and defensively," head coach Susan Bush said. "We need to stick to our game plan and work as hard as we can against these teams. If we do those things, I'll be pleased with the road trip." Freshman forward Jessica Zavalza is the reigning Conference USA Offensive Player of the Week following her two goal performance in UH’s 2-0 win over Louisiana-Lafayette last weekend. Zavalza leads the club with three goals and six points just three games into her collegiate career. The Longhorns own a 3-1 lead in the all-time series history with Houston. However, the Cougars’ lone victory came in Austin in thrilling fashion, as they pulled out a 3-2 overtime win in 2000. SAN FRANCISCO, CALIFORNIA (September 9, 2008) Michael Whitehead’s one-over par 72 was Rice University’s best score Tuesday as the Owls concluded play at the San Francisco Invitational. The tournament held at the historic Olympic Club was the team’s first competition of the fall season. Whitehead, who had shot rounds of 77 and 76 on Monday, finished in a tie for 42nd along with teammate Michael Buttacavoli. Buttacavoli had opened tournament play with a 72 Monday, shot a 74 later that afternoon but carded a 79 to finish with a three-round score of 225. Also competing for Rice were Kyle Kelley (T-63 – 77-78-76-231), Christopher Brown (T-67 – 77-79-77-233) and Robert Burrow (70 – 82-76-76-234). As a team, Rice finished in 14th place at the season opener. The Owls shot a 301 Tuesday after team scores of 303 and 304 to finish with a 908. California’s Mike Jensen tied for first individually with a three-round score of 213 (even par) and helped lead the Bears to the team title by eight strokes over second place Colorado. Cal had an 11 stroke lead over the field after Monday’s play and held on to win after shooting a 293 Tuesday. Colorado carded a 286 for the final round. Colorado’s Derek Tolan shared individual medalist honors. Rice returns to action next week when the Owls travel to the Kansas Invitational hosted by the University of Kansas. FORT WORTH, TEXAS (September 8, 2008) Former TCU women’s tennis head coach Roland Ingram is one of four players, coaches or administrators selected to be inducted into the Texas Tennis Hall of Fame in Waco. Ingram served as an assistant under Bernard “Tut” Bartzen during the 1983-84 season and then moved up to become the first full-time women’s tennis head coach in TCU history in the fall of 1984. During his 19 seasons in Fort Worth, Texas, Ingram put together a 323-158 (.672) overall record for the Horned Frogs, with 16 of his 19 squads posting winning records. Six of Ingram’s squads finished the season ranked among the top 25 and nine were in the top 50.
was honored as the Coach of the Year on five occasions, including the ITA Southwest Region and C-USA honors in his final season in 2002. In addition, Ingram was named to the Texas Tennis Coaches Association Hall of Fame in 1995 and to Schreiner College’s Hall of Fame in 2003. Ingram coached four of TCU’s All-Americans in his tenure. In 1988, he guided Rene Simpson and Tory Plunkett to All-America honors and 12 years later in 2000, he coached Lucie Dvorakova and Daria Zoldakova to All-America status in doubles. Ingram’s coaching career began in 1966 at Amarillo High School, where he stayed until taking over the program at Midland Junior College in 1974. In his first season, his Midland squad captured the NJCAA?National Championship while also winning the singles and doubles competitions. Prior to coming to TCU, Ingram served as the head tennis professional at Colonial Country Club for seven years. As a college player at Schreiner College in Kerrville, Texas, Ingram earned national titles in both singles and doubles at the 1961 Junior College Championships. He completed his college years at North Texas, earning both his bachelor’s and master’s degrees in 1966. 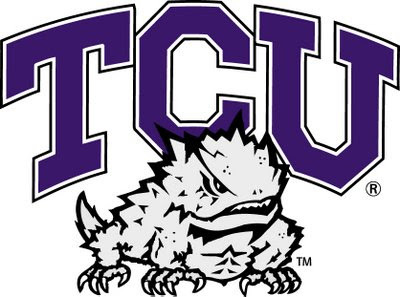 Ingram stepped down as the head coach of TCU following the 2002 season, which saw the Horned Frogs win their third consecutive conference championship. The induction ceremony is scheduled for Oct. 25 at the Texas Sports Museum and Hall of Fame in Waco. The group will also be recognized at the USTA Texas annual meeting in Dallas on Feb. 14. SAN MARCOS, TEXAS (September 7, 2008) They scored 36 points, ran for 233 yards and passed for another 232, but it was the turnovers that led to 16 first-half points that Texas State was talking about in the end. SMU scored on the first possession of the game as Bo Levi Mitchell threw a 21-yard touchdown pass to Emanuel Sanders to cap a 6-play, 57-yard drive. It was the first of five touchdown passes for Mitchell. The Bobcats had a pair of fumbles on their first two possessions and the Mustangs capitalized on the second when Mitchell hit Aldrick Robinson for a 32-yard TD strike to give SMU at 14-0 lead at the end of the first quarter. The second quarter began with Clint Toon coming off the Texas State bench and driving the Bobcats down to SMU’s 33 yard-line before Tyler Jones intercepted his pass that was intended for Alvin Canady. Then Anthony Stowe recovered another fumble at Texas State’s eight-yard line before Mitchell hit Sanders for another TD pass to give the Mustangs a 21-0 lead. Texas State scored its first points when Karrington Bush ran for a two-yard touchdown to cap a 17-play, 80-yard drive to make the score 21-6. Senior kicker Andrew Ireland’s point after attempt was blocked and SMU’s Derrius Bell picked up the miss and returned the ball 80 yards to give the Mustangs two more points. After Mitchell threw another touchdown pass to Sanders on SMU’s next possession, the Bobcats closed to within 30-13 when Toon ended the half with a nine-yard touchdown pass to Cameron Luke. Toon threw another touchdown pass to Luke on Texas State’s second possession in the third quarter to make the score 30-19 before Ireland’s kicked his extra-point try wide. After both teams exchanged field goals, SMU extended its lead to 40-22 on a seven-yard touchdown gallop by DeMyron Martin. Texas State scored a pair of touchdowns on its next two drives when Toon hit Luke for a 29-yard TD pass and Bush from five yards to make the final score 47-36. “We kept fighting and coming back in the game,” said Texas State head coach Brad Wright. “But in the end, the 16 points we gave up on offense proved to be too big a difference to overcome. 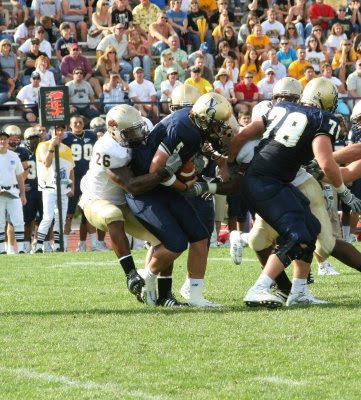 Bush finished the game with 111 yards rushing, becoming the first Bobcat to run over 100 yards in 2008. Toon threw for 111 yards and one touchdown, while he combined with Stan Zwinggi and Alvin Canady for another 111 yards on the ground. Toon also enjoyed a stellar performance throwing the football as he completed 19 of his 27 passes for 225 yards and four touchdowns. The Bobcats will travel to Northern Colorado on Sept. 20 before returning home to play host to Southern Utah and Texas Southern. HOUSTON, TEXAS (September 6, 2008) The Houston Texans extended the contract of T Eric Winston, the team announced today. Winston (6-7, 309) is beginning his third NFL season after being selected with the 66th overall pick in the third round of the 2006 NFL Draft. The former University of Miami standout has started the last 23 straight games at right tackle for the Texans. According to Stats, Inc., Winston has surrendered just six sacks in his 23 starts, an average of 0.26 sacks allowed per start, or one every four games. Winston’s sack percentage ranks first among members of the 2006 draft class with at least 10 starts. Winston was a part of the Texans offensive line in 2007 that allowed just 22 sacks on 529 pass attempts, or 4.0 percent of the time. That sack rate was tied for seventh-lowest in the league. The Texans line has reduced its number of sacks allowed in each of the past two seasons. Houston’s 21-sack decrease from 2006 to 2007 was the third-best improvement for any line in the NFL last year. FORT WORTH, TEXAS (September 5, 2008) For the second-straight season, three TCU women's tennis players appeared in the first preseason ITA collegiate tennis rankings. Senior Anna Sydorska and junior Nina Munch-Soegaard are ranked in singles play, while the doubles team of Sydorska and senior Macall Harkins also entered the poll. After earning a bid to the 2008 NCAA Doubles Championships, the duo of Harkins and Sydorska will kick-off the 2008-09 season ranked No. 9. The pair defeated seven ranked opponents in their first season together, reaching as high as No.11 last year. Munch-Soegaard leads the Frogs with a singles ranking of No. 47. The Amarillo, Texas native earned All-Mountain West Conference Singles Team honors last season, while also being named the Texas Panhandle Sports Hall of Fame Tennis Player of the Year. As a sophomore, she led the team for the second consecutive year with an overall record of 26-11. She topped nine ranked opponents, reaching as high as No. 55 last season. Sydorska will also enter the year ranked No. 95 in singles play. The senior from Lviv, Ukraine earned All-MWC singles and doubles honors for the third consecutive season last season, posting an 18-9 overall record. She reached as high as No. 67 last season after defeating two ranked opponents. TCU opens the season next weekend, Sept. 12-14 at the Bulldog Invitational, hosted by the University of Georgia in Athens, Ga. TCU will travel to Georgia, California and Hawaii before coming home to host the ITA Southwest Regional at Bayard H. Friedman Tennis Center, Oct. 23-27. FORT WORTH, TEXAS (September 4, 2008) TCU women's tennis head coach Jefferson Hammond will take a half dozen Frogs to the 2008 Riviera/ITA All-American Championships at Pacific Palisades, Calif., Sept. 27-Oct. 5. The six Frogs selected for this year’s tournament tops TCU’s highest number of players selected all-time. Senior Anna Sydorska is making her third appearance at the All-American Championships, selected alongside doubles partner, senior Macall Harkins, for main draw doubles, as well as prequalifying singles. sophomore Idunn Hertzberg for prequalifying doubles. Last spring, the pair recorded a perfect mark of 8-0 in league play at the top two positions. Junior Nina Munch-Soegaard, TCU’s wins leader with an overall record of 26-11 last season, was selected for qualifying singles and will join sophomore Maria Babanova in prequalifying doubles. The duo posted a perfect 10-0 record last season. HOUSTON, TEXAS (September 3, 2008) Rice University has announced its Conference USA basketball slate, completing its 2008-09 schedule. The 2009 C-USA schedule mirrors the teams played last year. Again this year, Rice plays home-and-home series with East Carolina, Houston, SMU, Tulane and UCF. In addition to home-and-home series, the Owls played three league opponents at home and three on the road last year and the sites for those games will be flipped for the 2009 season. The Owls will also play host to Southern Miss, Tulsa and UTEP while traveling to Marshall, Memphis and UAB in 2009. Rice will open C-USA play at Tulane on Jan. 10 before playing back-to-back home games against SMU and UCF (Jan. 14 and Jan. 17). The league schedule takes the Owls to defending Conference USA champion Memphis on Jan. 24. Rice plays at crosstown rival Houston on Feb. 7 and plays host to the Cougars on Feb. 28. Rice closes out regular-season league play March 7 against Tulsa. The Conference USA Tournament is slated for March 11-14 in Memphis, Tenn. Earlier this summer, Rice released its nonconference schedule which includes home games against Oklahoma and Texas A&M. The Owls open the 2008-09 season against 2008 NCAA Tournament participant Portland State on Nov. 15th. HOUSTON, TEXAS (Spetember 2, 2008) The defending 2007 Conference USA cross country champions, the Rice Owls, have been selected by the league's head coaches as the team to beat in 2008. Head coach Jim Bevan's squad received nine out of 12 first place votes. The Owls, winners of two of the last three league titles, return a full squad from a year ago. Leading the Owls will be sophomores, Allison Pye and Becky Wade, who were both All-C-USA first-team members as freshmen in 2007. Rice became the first program to win the triple crown in 2007, claiming conference championship titles in cross country, indoor track and field, and outdoor track and field. Only one other school (Western Kentucky) out of 32 conferences did what the Owls did. Rice's remarkable 2007 season was highlighted by winning the NCAA South Central Regional title. The Owls' experienced team will be a positive factor in their attempt for back-to-back C-USA championships. The 2008 C-USA Championship will take place on Nov. 1 at the Mike Rose Soccer Complex in Memphis, Tennessee. DES MOINES, IOWA (September 1, 2008) The Grand View College football team won their inaugural game today knocking off Briar Cliff University 20-17 at Williams Stadium in front of 4,300 excited fans. The Vikings are now undefeated in the school's short history of football at 1-0, while Briar Cliff starts the season off at 0-1. Both teams exchanged possessions through the first half until Briar Cliff took the lead on a 27 yard field goal with 3:24 left in the first quarter. Grand View answered back early in the second quarter when Brett Opdahl hauled in a 31 yard touchdown pass from Gregory Charles to record the first points in Grand View College football history. Briar Cliff connected on another field goal to make the score 7-6 going into the second half. Another Briar Cliff field goal gave the Chargers the lead at 9-7, until Lawrence Furlow scored on a 50 yard touchdown run with 5:43 to go in the third quarter. Grand View's final score came off of an 89 yard interception return for a touchdown by Quentin Palmer making the score 20-9. Briar Cliff scored their only touchdown of the game with three seconds left in the game. The Vikings are lead by head coach Mike Woodley, who is the former head football coach at Sam Rayburn High School in Pasadena, Texas. The Vikings hit the road next week to take on Simpson College in Indianola, Iowa at 1:00pm.